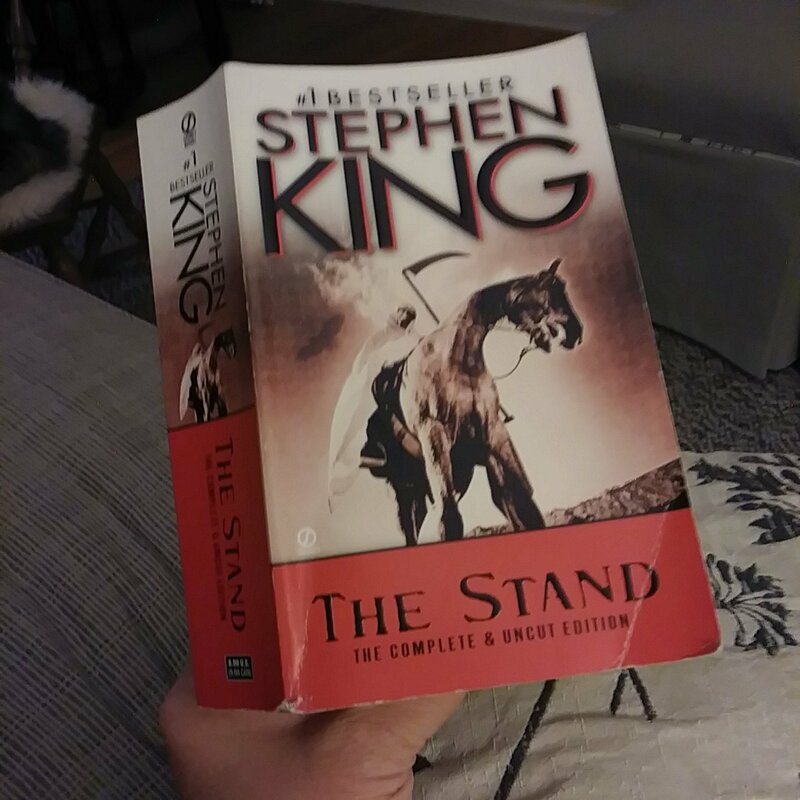 The Stand (The Complete and Uncut Edition) by Stephen King. Breathlessly finished. It’s a phrase I have repeated over and over in my life, especially when I have been most afraid. It is the only thing I know to say in the face of darkness and fear; that or the words, “I love you.” Even Stephen King knows that evil cannot stand for long against light. Laughter. Or, love. The characters in this novel know, without needing to be told, who Mother Abagail and the dark man are. They feel the powers at war within themselves; they have dreams which will not let them sleep. And, they are called. Some make their way to Boulder, Colorado where the forces of good are gathering under Mother Abagail’s guidance. Some make their way to Las Vegas, so aptly nicknamed Sin City. My mother has often suggested that the Enemy is not ugly at all. Because he is the father of lies, the ultimate deceiver, perhaps he is really quite handsome. Perhaps he wears a jacket with two buttons on the front pockets, blue jeans, and low-heeled cowboy boots such as the Walkin’ Dude does. Perhaps the plague which annihilated most of the world’s population was begun by scientists with less than honorable intentions. Or, perhaps the very hand of Satan was behind their invention gone awry. In any case, the world which Stephen King created in this novel does not seem as far fetched as it once might have been. In fact, the scariest part of all is that it feels downright possible. Until the very end we are drawn into the battle, witnessing the stand of courage against that which frightens us most. Yet, I will fear no evil. Even when it seems it will not be vanquished. Roland, the gunslinger, isn’t any one I can admire right now, even though he is clearly the hero. He isn’t a hero as I would define one: honest, fearless, and loyal. He wanders through the dry desert, following the tracks of the man in black, leaving destruction in his wake. Allie, with whom he has slept (for information) is dead; the town, Tull, is destroyed behind him. He meets a boy, a brave boy named Jake, who has somehow withstood the heat, the lack of food and water. They go together, the boy clearly admiring the gunslinger and asking for stories from his youth. How, for example, did Roland become a man? The answer is less than pleasant. The gunslinger used a trick against his teacher, choosing a weapon which was perfectly admissible and yet most difficult to take a position against. The battle is bloody, and I can tell this is just the beginning of many such battles. For there are hints that Roland will exchange the boy, use him as “a poker chip” which Jake himself knows, when next they meet the man in black. It ain’t no Girl Scout camp, this journey to the Tower. The fact that Roland came from New Canaan ought to be enough to tell you that, for as anyone knows, Canaan was not a land of the noble or good. No matter what Stephen King may tell you. It will be interesting to see where this series takes us, if I continue in reading all 7 books. After I get back to the Man Booker list, of course. Those of you who know me know that I rarely finish a Stephen King novel. 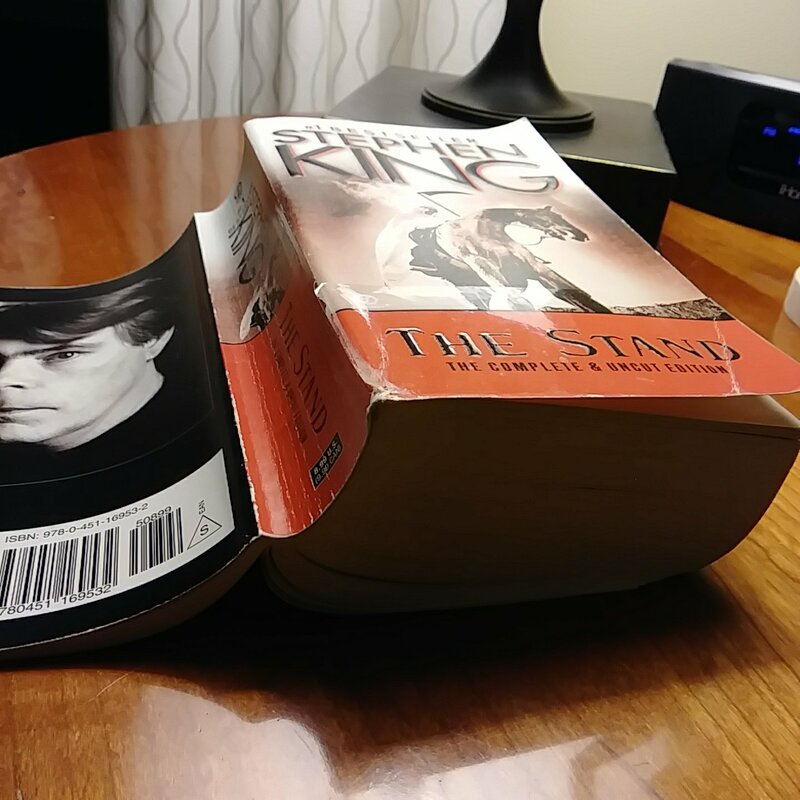 I begin with the best intentions, hungry for a good story, but Stephen King knows far too much about the enemy (and the Bible) to be playing around. His novels can cross from being entertaining to being demonic because of this familiarity. I’m enjoying The Gunslinger because it mimics The Lord of the Rings, a little bit, by King’s own admission. I, personally, would never equate him with Tolkien. But, there are the elements of a quest through interesting landscapes, foreboding events, evil and good characters. Before I close, I should say a word about the younger man who dared to write this book. That young man has been exposed to far too many writing seminars’ promulgate: that one is writing for other people rather than one’s self; that language is more important than story; that ambiguity is to be preferred over clarity and simplicity, which are usually signs of a thick and literal mind. Fascinating! I think that he has described the difference between the American novel and those in translation with that one quote. I found Japanese literature so frustrating when I first began to read it. “What?” I thought, “there’s no beginning, middle or end?” I had been trained, you see, from the teachers at Naperville Central High School in the 1970s, not to look outside the lines. Japanese literature is more typically a “slice of life” style of writing, jumping into the moment and leaving before everything is resolved. So I’ve been caught on the horns of a dilemma: is writing to be clear and simple versus ambiguous? I know that I have been at turns frustrated and thrilled with the ambiguity found in some of my favorite novels: Kafka on the Shore, for example, or Tomorrow in the Battle Think on Me. I know I prefer Haruki Murakami and Javier Marias to Stephen King. Maybe he’s justifying his straightforward storytelling with that comment, and I do appreciate his ability to entertain with a book that reads like a film unfolding in vivid technicolor. But as to the quality of writing, give me an ambiguous novel full of gorgeous language any day. My mind is neither thick or literal. So. The Dome. To his literal readers, the Dome which King created could be likened to an invisible shield covering Chester’s Mill which when rapped with one’s fingers resonates with the same sound one would hear when rapping on an upside down Pyrex bowl. The people under the Dome are trapped. They are caught with limited resources, an evil selectman who longs for power, and their own base tendencies. For some, this means resorting to suicide. Others will turn to violence. Only a few emerge as true leaders who are capable of thinking of others, finding a solution, exercising extreme courage and brilliance in solving the problem. When I was a little girl, I remember lying in bed at night and thinking, “What if…? What if our world is not the only world? What if I am only one small child in some small corner of an endless array of planets? What if I’m not nearly as important, if no one I know is really as important, as we all suppose we are? And, what if we are at the mercy of an even greater world which spins much more powerfully than our own?” I can’t explain how helpless, how insignificant, I felt when I mentally meandered down that path. But, it’s a place that King takes us, and in so doing causes us to consider the power of kindness. Not doing wrong to one another. Or, at the very least, taking pity. At the end of the day? I’m glad I read this book. If you’re a fan of Stephen King, you’ll probably love this book. 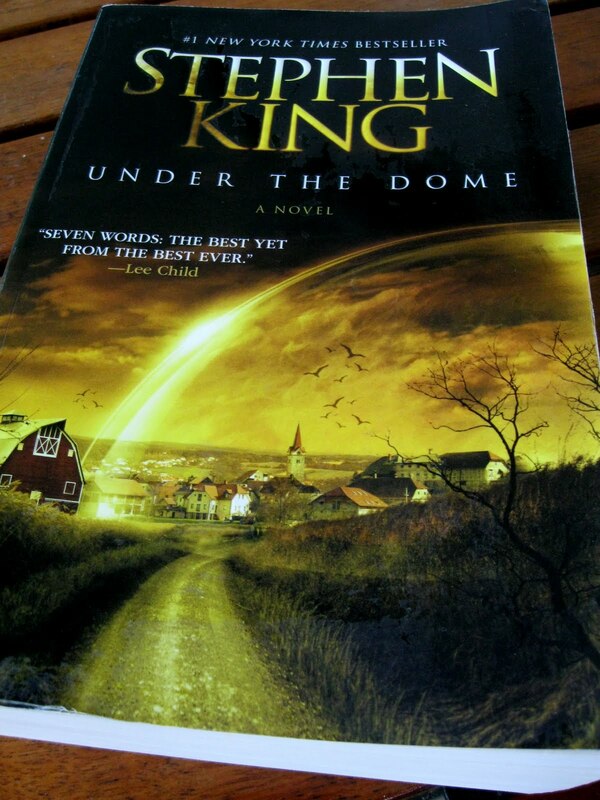 So many conflicting feelings about Stephen King’s Under the Dome. 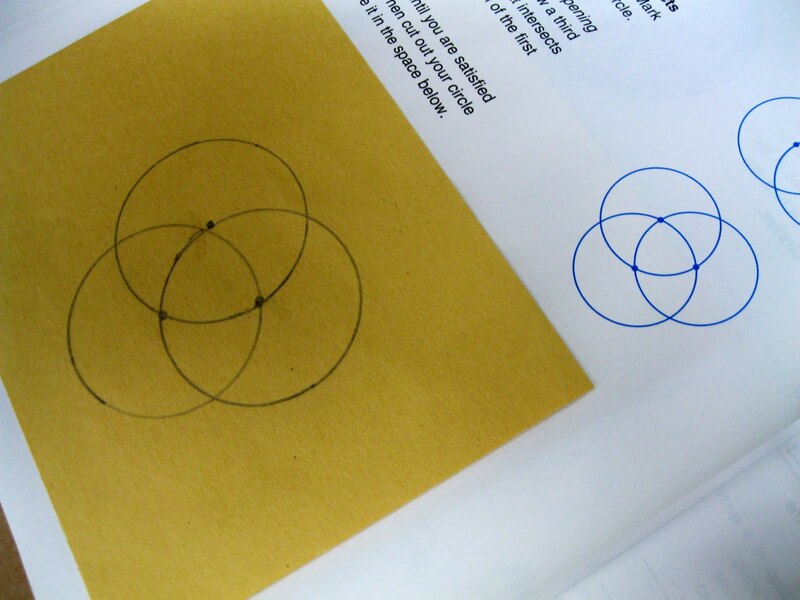 Like the non-centric circles my Accelerated Math class drew last week, I have at least as many thoughts overlapping as in the drawing above. 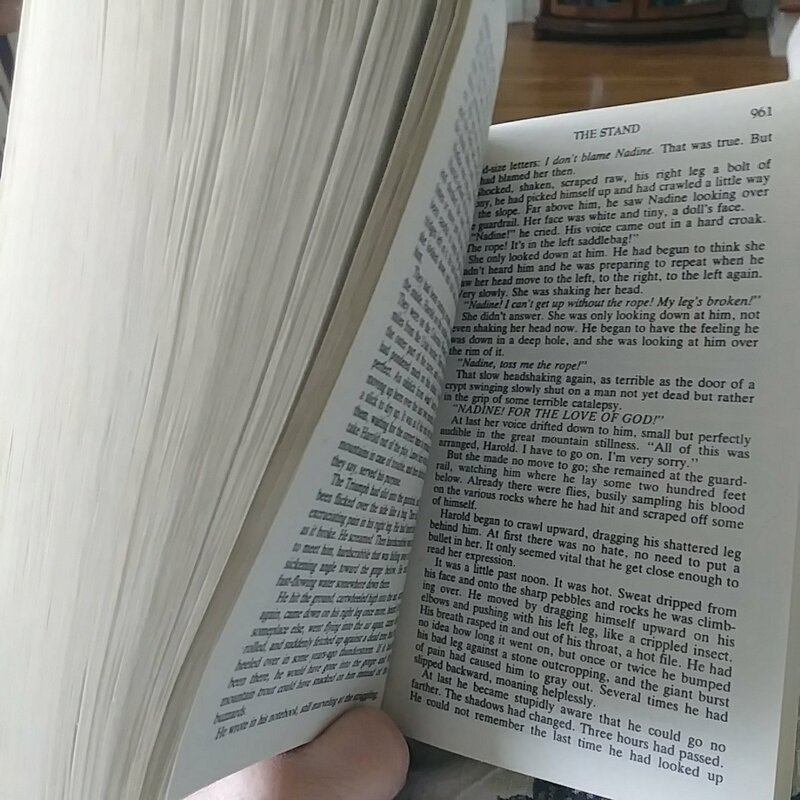 The book started out fabulously. Could-not-put-it-down-good. That’s rare, for me, especially with a novel I would consider of the pulp fiction variety. A dome, from literally out of the blue, descends on Chester’s Mill, Maine, completely cutting off a section of the town. Cruise missiles can’t destroy it, neither can a super strength acid developed by the government in the hopes of creating some kind of escape for the people. In typical Stephen King form we have sarcasm (which I find hilarious) and a lens for examining 21st century America (which I find to be sadly accurate). But, we also find his mockery of religion. Or, at least of those who supposedly uphold it. The first quote is from Revelation 8:10; the second is Revelation 8:11. This unnerves me because I don’t know where King is going with his knowledge. If he uses it to advocate good vs. evil, or better yet the Enemy’s defeat, great. But, if I’m on page 779 (which I am) of 1072, and all I’m left holding at the end is a pile of lies underneath dust and ashes, I won’t be too thrilled. I’m going to see if I can finish it tonight because 100 other books are now calling my name, and King’s voice is growing ever fainter in their vehemence. I just have to see what he does with the Dome: why has it appeared, and will it go away?